Exhibited in Paris at the Old Salon in 1890, 'Tritons' was the first painting by an Australian to receive an honourable mention. The work depicts a group of tritons – legendary creatures who lived both on land and at sea – enjoying an idle moment in their tranquil surroundings, and introduces some of the features which would come to characterise the artist’s work: a fascination for mythological subjects and the portrayal of the exotic within an intimate setting. 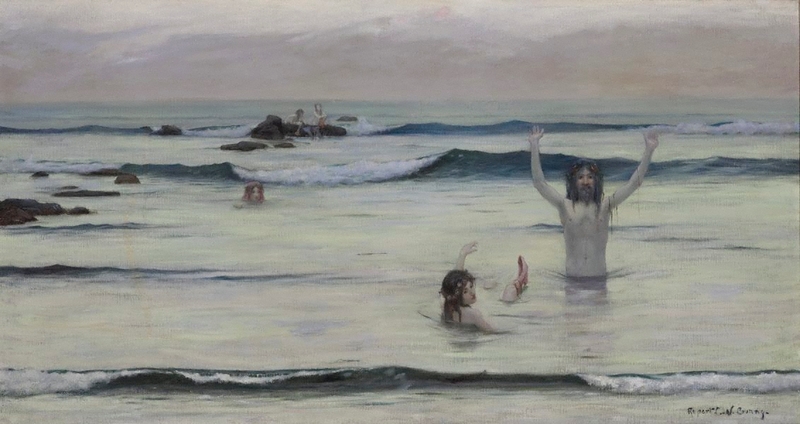 Rupert Bunny has skilfully created a twilight ambience through delicate colour schemes, where the pale blue, silvery ocean and pink-toned sky are quietly reflected in the flesh tones of the figures. Signed l.r., black oil "Rupert C.W. Bunny.". Not dated.